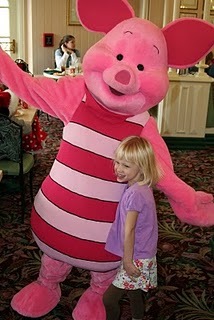 We spent Sunday at the Magic Kingdom. As soon as we arrived on Main Street, I knew it was not a normal day. The Park had just opened and there were people lined up along the parade route, odd since the parade is always in the afternoon and occasionaly in the evening as well. Then as we walked further toward the castle we saw camera crews everywhere, including 2 elevated above the crowd. Then we heard Disney cast members asking for volunteers to particpate in the festivities. It turns out that they were filming their Christmas Day parade and concert for TV that day. The concert was the Jonas Brothers and there were screaming tweens crowded around the stage. We found out later that they had planned to be filming the past 2 days but the rain prevented it, so they were trying to get everything done in a very compressed time span. We were turned toward Tomorrow Land since all paths around the castle were closed. First stop Buzz Lightyear – always fun. Although after riding Toy Story Mania, not nearly as good of a ride. 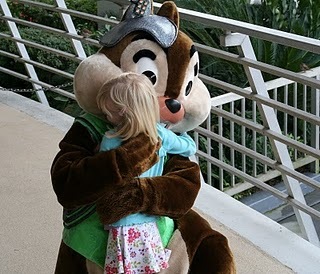 When we exited the ride we saw Chip-N-Dale and Juliana was so excited. 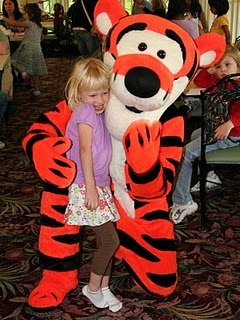 Our last trip to Disney when Juliana was 2, she had a day where she wasn’t feeling well. 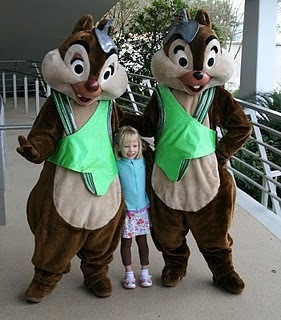 We were at Epcot and I had been visiting characters with her while the rest of the group was on Soarin’ and Chip-N-Dale were the last characters in the room. By the time she got to them so was in no mood for a picture. 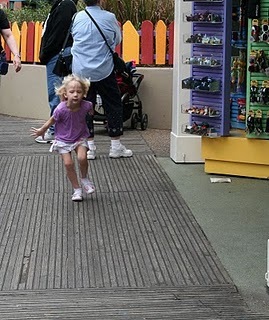 The pictures we have from that trip are of her running from them with tears streaming down her face. So she had spent the first two days of our trip looking for them. Then I went on Space Mountain – just one time. 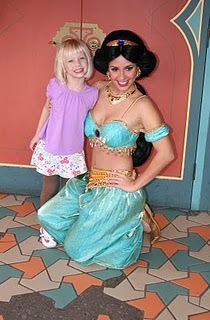 And met Juliana and my mom in Fantasy Land where they were waiting in line for Donald and Dasiy. 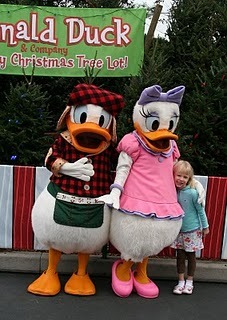 Juliana was only interested in Daisy, but they were a package. 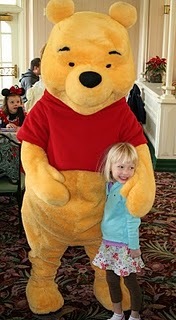 We braved the Dumbo line and rode Winnie the Pooh (she loved), Peter Pan (also loved) and then we headed to the Crystal Palace for our lunch reservation – lunch with Winnie the Pooh characters. After lunch we went back to Fantasyland and rode It’s a Small World which of course Juliana loved…Later im the day she asked if we could go ride little earth again. I told her we were only allowed to ride one time. By this point the stage area and parade festivities were ending and that crowd spilled out into the attraction areas making it suddenly more crowded. 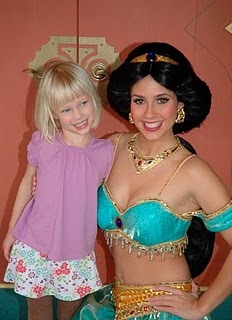 We walked to Big Thunder Mountain for Fast Passes and while we waited for our time slot we went to the Tiki Room and waited in line to see Princess Jasmine. 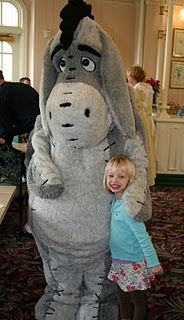 Then back to Big Thunder Mountain – Juliana spent the whole ride huddled under my arm asking if the ride was almost over. We hopped on the train to Toon Town and visited Mickey and Minnie’s houses – I never knew that the fridge opened and the microwave had popped corn inside…never thought to play with the knobs and doors myself. 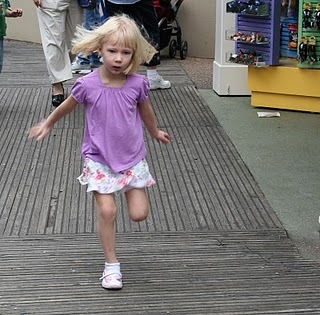 Juliana was much happier with the Barnstormer – smaller coaster – she came running off with a sudden burst of energy. We wandered through the shops on Main Street and then headed back to the hotel for dinner and bed.